I am a part of a hiking family, or rather, my family is a hiking family and I tag along. The idea of sweating along mosquito-filled paths, climbing up a stony hill, or pooping in the woods is not fun for me. But, like I said I am part of a hiking family. We go on many camping trips each year because my wife and children love them. We hike and camp so much that our basement looks like an REI store. Since they love it so much, I go along and wear a smile for as long as I can. I must admit, being outdoors has many draws. Living in NYC, fresh air and quiet surroundings are hard to come by. The woods provide that. Every time I camp, I feel refreshed after spending the night detoxing my body with the clean breezes my lungs inhaled. We have had our kids on camping trips and hikes since they were in diapers. My wife grew up hiking and camping, so those things are second nature to her. I, on the other hand, have had to learn as I go and mostly use common sense, of which I have very little. That’s why I was so excited when I came across the book, Get Your Kids Hiking, by Jeff Alt, at the NYC Book Expo. First of all, I have already been able to get my kids hiking (or actually, the kids got their dad hiking). But secondly, I could finally learn the things that I should have known all along and could quit faking it. The book is a fast read, and is both informative and entertaining. Within the book are checklists, necessary gear lists, tips, suggested hikes, sections on what to eat and bring with you, and signs that every parent needs to know, as well as stories from Jeff Alt’s many hikes. And there is a chapter for each age group, from infant through teens. 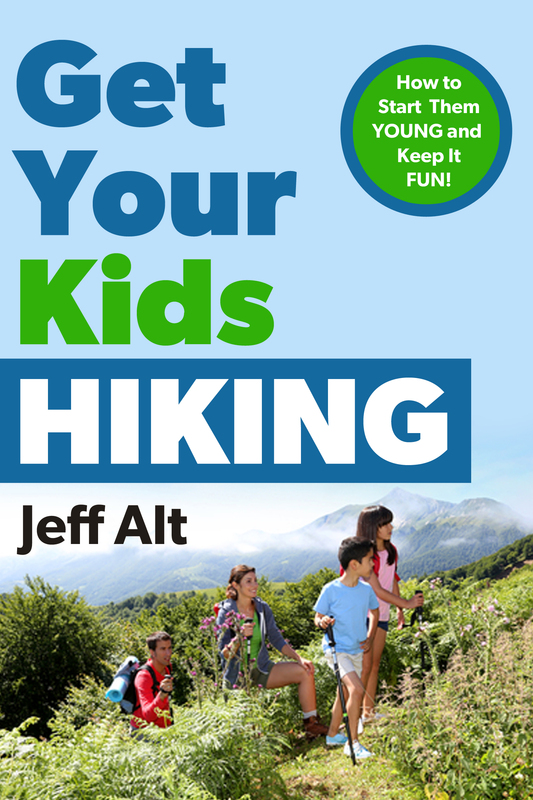 Since my kids have been hiking since an early age, according to Jeff Alt, it won’t be that difficult to get them to hike when they are teens. I appreciated Mr. Alt’s quick to-the-point discussions. Most parents want “How to” books that get right to the point. This book does just that and in an informative way. I highly recommend the book to those parents, like me, that want their kids to experience the outdoors and appreciate them, but don’t really have the knowledge that it takes to do it successfully.